Not too long ago, I heard about this awesome program called Daily Goodie Box – it’s a fun way to learn about different brands through the free (and full-size!) items you receive! I signed up and got my first box less than two weeks after joining. There are also some pretty sweet coupons for the brands included! And I’m good at having an opinion on things. And I’m pretty picky with ingredients and products- I have to be because of the health issues I’ve had. Truth is, I didn’t love every single item I received in my Goodie Box. And I’ll tell you why! 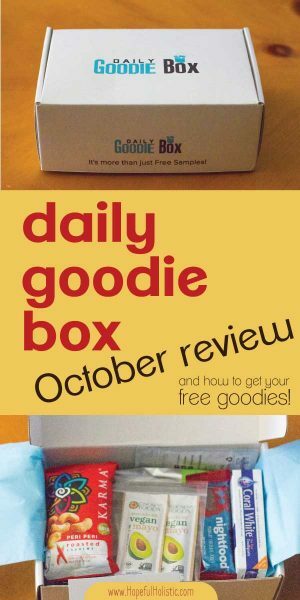 Without further adieu, here is my unbiased, unfiltered opinion on everything I got in my October Daily Goodie Box! 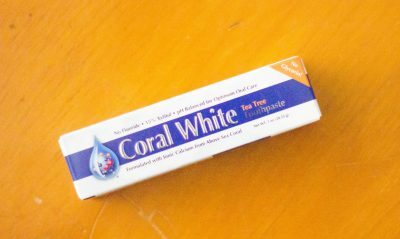 Coral calcium is literally the first ingredient. This sounds like it’s so good for your teeth! And of course, it’s free of fluoride and sodium laureth sulfates. That’s important to me. The toothpaste tastes fresh and has tea tree oil (which is good for your gums and makes it smell amaaazing!). I’ve been enjoying using it, and it’s a perfect travel size for some upcoming trips I’m planning! I’m excited to see if it really works to whiten my teeth. It might not be good for people with sensitive teeth though, because it does have hydrogen peroxide which can increase tooth sensitivity. Otherwise, a fantastic product overall! Mmm, roasted cashews. I hadn’t heard of this company before but these looked amazing! There’s a tiny bit of sugar and some processed ingredients (citric acid and maltodextrin) but other than that the ingredients are clean. These ones have red chili spice, and I’m a hot food wimp, but they still tasted great and weren’t too hot. 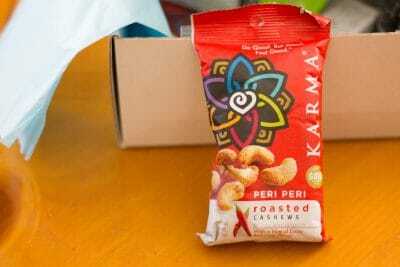 The packaging proudly boasts, “these nuts will liven up your taste buds” and I can definitely attest to that! They’re zesty and a little bit addicting. The bag didn’t last long! Yum. Self-professed coffee fiend over here… I usually grind my own coffee but this one came ground, and it’ll work great with my french press! I really appreciate that it’s fair trade and certified organic. I wouldn’t call myself toooo much of a coffee addict, but this was probably my favorite Daily Goodie Box prize! This is one company that I will gladly buy coffee from in the future! This is a really neat idea. 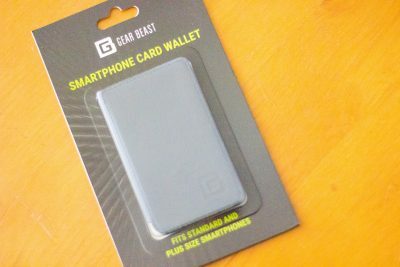 Most smartphone wallets are included as part of a case, and they’re specific to your model of phone. This one’s universal, and just sticks on the back! It also has a transparent pocket for your ID. I’m planning on looking super cool when I whip it out next time someone asks for my ID! What a neat idea for a bar! 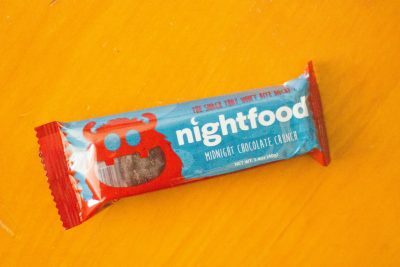 It’s got minerals and everything you need so that a midnight snack cures cravings, without messing up your sleep! There are some really great ingredients, like magnesium (which promotes restfulness) and chicory root fiber, but also some not so great ones… Like palm oil, sugar, brown rice syrup (aka sugar- and the first ingredient), and the mysterious “natural flavors”. Great idea for a bar, not so fantastic execution with the ingredients. I’m trying to avoid refined sugar and processed foods right now so I’ll be gifting this bar to my hubs, and I’m sure he’ll enjoy it! Now this one was fun to get. I don’t have kids (yet) but maybe I’ll keep this around? It’s awesome that this was a full-size product- it’s kinda huge! And they have free shipping on all orders! Pretty neat. 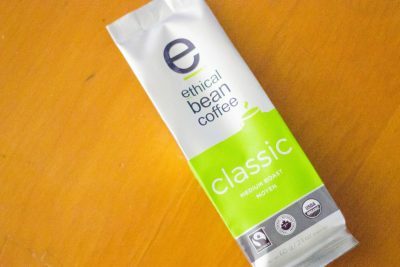 One thing that bugged me was that there wasn’t any information on this brand on EWG.org, but I looked up the ingredients. Even though they proudly state that they’re paraben and phthalate free, there’s still a long list of ingredients I’m not familiar with. Some didn’t have any research to go against, but on EWG, a couple of the ingredients stood out as problematic. The third ingredient, Cocamidopropyl betaine (say that five times fast) helps boost foam and is a cleansing agent, but there are concerns about irritation, allergy risks, and ecotoxicology. Then there’s the elusive “fragrance” listed on the ingredients too, which is an unregulated ingredient and could potentially mean a mixture of hundreds of carcinogenic chemicals. And lastly, one ingredient, Methylisothiazolinone, had a high hazard warning on EWG. It’s a preservative and has been linked to allergic reactions. Studies suggest it might be an irritant and neurotoxic too. Definitely not something you want anywhere near your baby. So, unfortunately, I’ll have to pass on using this, and I can’t in good conscious regift it to anyone. Take this as a reminder to read your labels and not just trust the “natural” wording or look of a product! 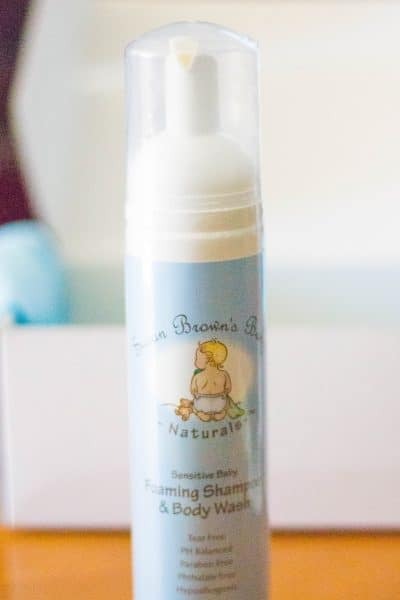 Susan Brown’s Baby- remove the toxins and I’ll think about buying from ya! 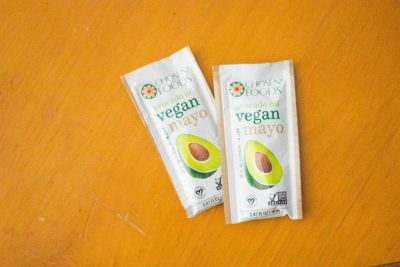 I like avocado oil, and I like mayo! This seems perfect for packing lunches- I hate when I have a meal to-go and the food gets soggy because I put everything on it beforehand. This could come in handy! There is some sugar in here, and citric acid, and some thickeners (xanthan gum, acacia gum, and guar gum), which could be irritating to a leaky gut. Still, most people should be just fine with the ingredients. It’s also completely non-GMO! I’ll keep this handy for next time I need a quick mayo fix. Ahh, energy drinks. I loved them a bit too much in high school, but in college, I stopped drinking soda, and energy drinks went with them. I never looked back. 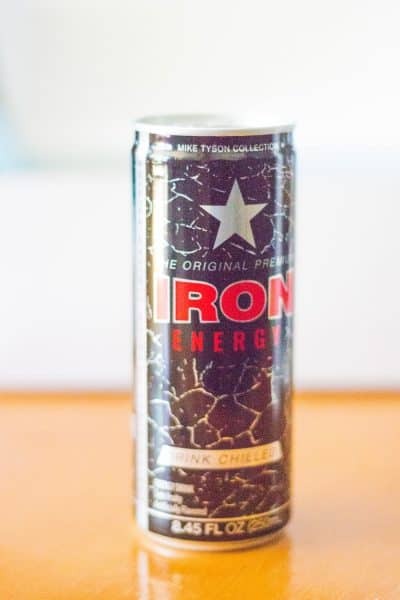 I don’t really care for the taste, they’re usually packed with unnatural ingredients, and no liquid energy can make up for sleep. This drink honestly doesn’t have the best ingredients either, and I have no desire to try it… But thankfully I have lots of friends who enjoy energy drinks, so I won’t have to toss it out! I went through an intense matcha phase for a while. I still really enjoy matcha, but it’s not an everyday I-need-it-now craving. 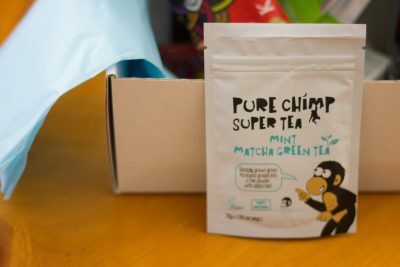 I was really excited to get this because it’s not just plain matcha, it also has mint, and I’ve never tried that combo before! The ingredients are perfect too- just matcha and mint. I’m looking forward to trying it! 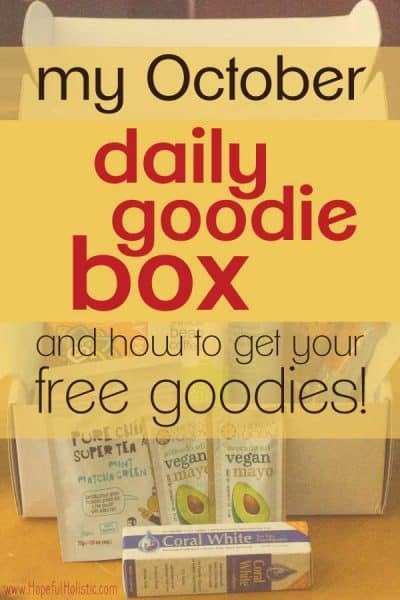 If you’d like to sign up to get your own goodie boxes, just visit DailyGoodieBox.com!